Published this October, Pacific Science volume 71, no. 4 arrived with a special section on habitat restoration, which includes seven open-access articles. We asked Editor-in-Chief Curtis C. Daehler and guest editors Melissa Price and Robert J. Toonen to weigh in on this issue’s special topic and other research important to the quarterly science journal. Vol. 71, Issue 4 includes a special feature: “Scaling Up Restoration Efforts in the Pacific Islands.” Why devote a whole section to this topic? We have lost a lot of native species to habitat destruction in the Pacific region. Today, considerable attention is being given to protecting native ecosystems, for example, in the Hawai‘i Governor’s Sustainable Hawai‘i Initiative to protect 30% of the state’s watersheds by 2030. However, much less attention is given to restoration efforts, or the conversion of nonnative to native-dominated habitats. Invaded ecosystems may be more at risk for wildfires, and may enhance invasions of nearby native ecosystems. A few large-scale restoration success stories exist, such as that of Hakalau Forest National Wildlife Refuge, and there are a number of small-scale efforts across the Pacific led by nonprofit groups. In this issue, we hope to promote conversations about how we can scale up restoration efforts to improve resiliency, promote ecosystem services, and reduce extinction rates across the Pacific region. 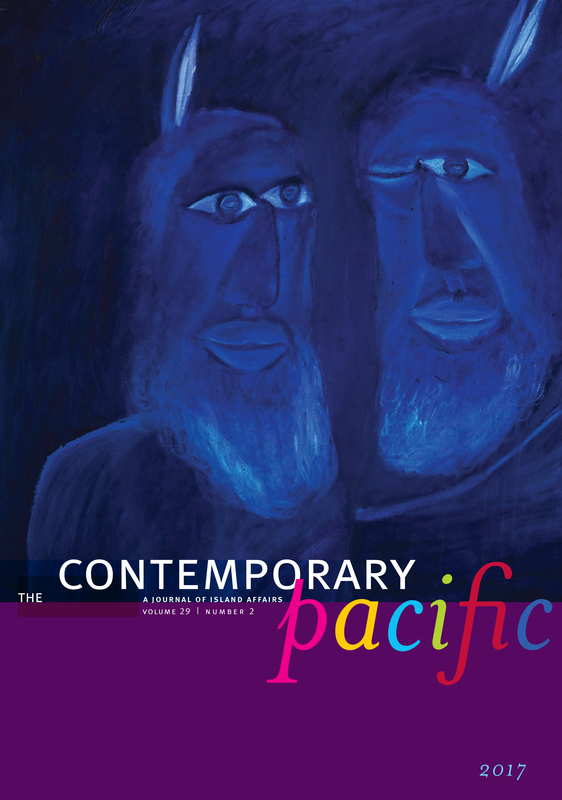 Melissa Price, guest editor of Pacific Science vol. 71, no. 4, is an assistant professor in the Department of Natural Resources and Environmental Management, CTAHR, at UH Mānoa. She provided this picture from her field work. What challenges did you face in the creation of this special section? The biggest challenges were representing the range of work being done around the Pacific and asking those working at small scales to think about how their work might be scaled-up. Also, a number of projects were just getting started, and it may be decades before there are results from these efforts. Finally, truly transformative work will likely be transdisciplinary. People involved in restoration must partner across sectors to solve challenging problems associated with restoration, such as seed production, removal of invasive plants and animals, and access for equipment and people to remote locations. We still have a long way to go in these areas, but we hope that this special collection will spark productive conversations. A visual interpretation for a spatial model of the social-ecological zones (wao kanaka, wao lā`au, wao nāhele, wao kele, wao akua) implemented during the aliʻi-era for the ahupuaʻa of Hāʻena, Haleleʻa, Kauaʻi. This model is being used by contemporary resource managers to inform large-scale biocultural conservation and forest restoration efforts within this social-ecological system (see Winter & Lucas, this issue for additional details; image credit: Ben Nyberg). The October 2017 issue of Pacific Science begins with a Special Feature, which includes seven open-access articles available on Project MUSE and Bio-One. From Demography of Marine Turtles in the Nearshore Environments of the Northern Mariana Islands, an open access article in this issue. Clockwise from bottom left: nearshore capture locations in relation to benthic habitat of ( A) Saipan, (B) Tinian, and (C ) Rota, and (D) an image of the free diver hand capturing a juvenile green turtle. Green and orange dots depict capture locations for green and hawksbill turtles, respectively. Shading indicates benthic habitat. This quarter’s issue of Pacific Science includes Demography of Marine Turtles in the Nearshore Environments of the Northern Mariana Islands, an open-access article; and an online-only supplemental for Methods for Measuring Bird-Mediated Seed Rain: Insights from a Hawaiian Mesic Forest. In the western Pacific, green (Chelonia mydas) and hawksbill (Eretmochelys imbricata) sea turtles are listed as Endangered under the U.S. Endangered Species Act (ESA). Population data are limited for both species throughout the entire region and particularly in the Philippine Sea. This study characterizes size class distribution, growth rates, habitat use, behavior, diet, and site fidelity of foraging aggregations of green and hawksbill turtles in nearshore habitats of Saipan, Tinian, and Rota in the Commonwealth of the Northern Mariana Islands (CNMI ). Between August 2006 and February 2014, we captured 642 turtles (493 green and 36 hawksbill turtles). … This is the first study within the CNMI to report on morphometric data and diet composition of marine turtles. These results provide an assessment of green and hawksbill turtle population demographics and habitat use in the CNMI. Adult specimens of Eriocheir ogasawaraensis, endemic to the Ogasawara Islands, collected in March, 2004, in Chichi-jima, Ogasawara, Japan, in dorsal view: female, 82 mm in carapace width (upper), male, 81 mm in carapace width (lower). Kobayashi and Satake in this issue compare the morphology of this endemic crab to that of its ontinental congener, the Japanese mitten crab, Eriocheir japonica, finding differences in sexual dimorphism. Photo: Satoshi Kobayashi. This quarterly issue of Pacific Science explores new research about Pacific crabs, fish, plankton, birds, grass, frogs, and eels. Thirteen commonly consumed types of fish caught in the North Pacific and locally available in Hawai‘i were analyzed using gamma spectroscopy to measure Fukushima-derived and historic 134Cs and 137Cs isotopes. All fish samples had detectable 137Cs above 95% confidence intervals. Three out of the thirteen samples had 134Cs, an isotope indicative of Fukushima releases, detected above 95% confidence intervals. The highest 134Cs and 137Cs concentration in the examined species was in ‘ahi tuna, carrying 0.10 ± 0.04 Bq/ kg and 0.62 ± 0.05 Bq/ kg, respectively. Other samples with 134Cs activities found above their 2-sigma uncertainty were albacore tuna and swordfish. Historic and Fukushima-derived contributions were evaluated, and in several samples the Fukushima-derived radiocesium dominated the total radiocesium inventory with up to 61% contribution. All activities were below derived intervention limits of 1,200 Bq/ kg, and the doses to humans from consuming the fish attributable to radiocesium were 0.02 – 0.2 μ Sv, in comparison to 6 – 20 μ Sv contributed by the natural 40K present in the same fish.